The book of Isaiah is the whole Bible in miniature. 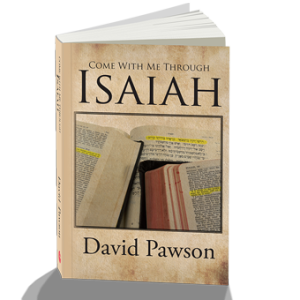 Click here fore a sample of Come With Me Through Isaiah. The first 39 chapters reflect the themes of the 39 books of the Old Testament and the last 27 chapters prefigure the events of the New, from John the Baptist to the new heaven and earth. Yet the prophet lived and died (horribly) centuries before Jesus was born. A miracle in words! These studies were first given verbally by the author to his congregation. Now in print, readers are invited to ‘come with me through’ these marvelous messages which are as timely as they are timeless.